Lithuanian Clusters Association established in 2014. Mission of the Association – strengthening the competitiveness of Lithuanian business by developing clusters. Vision: global, influential, sustainable association best representing Lithuanian clusters. to strengthen clusters’ management competences and spread good practice. Principles of activity: the association implements its mission, vision, goals, objectives and activities in accordance with principles of business ethics, transparency, openness, honesty. Dr. Laimutis Paškevičius has finished studies of Curative Medicine and Healthcare Administration and residency of Organization at Vilnius University (VU) Faculty of Medicine, also Master’s studies of Business Management and Business Administration at VU International Business School, and part-time studies at Nordic School of Public Health (BRIMHEALTH) in Sweden. In 2017, L. Paškevičius defended the dissertation on Complex Management of Patient Safety Events in Lithuanian Hospitals in the area of Social Sciences in the field of Management (03S), he was awarded a Doctoral degree in Social Sciences. Currently L. Paškevičius manages one of the biggest private medical establishment in Lithuania and Baltic Countries – UAB SK Impeks Medical Diagnostic and Treatment Center and holds position of a Chairperson of the Board (2004 – now), is a President of the Lithuanian Private Healthcare Establishment Association and a Chairperson of the Board (2006 – now), initiated establishment of the Lithuanian Medical Tourism Association Medicinos Lietuva and was elected as its President (2012 – now), is an initiator and one of the founders of the Lithuanian Medical Tourism Cluster LITCARE, holds position of a Chairperson of this Cluster’s Board (2013 – now) and is a President of the Lithuanian Medical Tourism Cluster Association (2013 – now), is one of the initiators of the established Lithuanian Cluster Association and was elected as the President of this association and the Chairperson of the Board (2015 – now), holds position of UAB Denticija Board Member (2010 – now). L. Paškevičius is also one of the founders of the Lithuanian Chamber of Tourism and a Member of Presidium, a Member of Presidium of Lithuanian Business Employers’ Confederation, a Member of Presidium of Lithuanian Business Confederation and a Chairperson of Health Affairs Committee, a Member of the Board of the Union of Lithuanian Doctor Managers, a Deputy Chairperson of the Board of Patient Safety, Innovations and Quality Fund; a lecturer of VU Faculty of Medicine of Public Health Institute. L. Paškevičius has experience of 8 years in Public Administration in the Ministry of Health of the Republic of Lithuania (as Advisor to the Minister, Head of Human Resources Department, Head of Healthcare Resources Department, Head of Public Health Department and other positions), experience of 15 years in public work (Head of 4 associations, is a member of various organizations’ management bodies), experience of 15 years as a lecturer and consultant (at the Lithuanian Public Administration Institute (LIVADIS), Mykolas Romeris University, Vilnius University, etc.). L. Paškevičius has management work experience of 15 years in the Private Healthcare Sector – manages UAB SK Impeks Medical Diagnostic and Treatment Center, organized introduction of management and quality systems, ISO 9001, ISO 14001, ISO 15189 standards in this establishment, JK Treatment Abroad Accredited Code of Practice standard; Balanced Scorecard system; German TEMOS Excellence in Medical Tourism and Quality in International Patient Care standards; USA JCI (Joint Commission International) Hospital standard, (Gold Seal standard); is certified and registered by ISO 9001:2008 standard in the International Register of Certificated Auditors (IRCA) as the Head Auditor of ISO 9001:2008 standard (No. LA2/10/LT/35110). 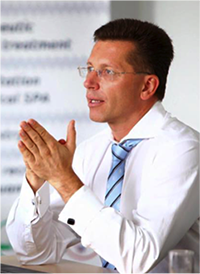 L. Paškevičius was a Member of the Board of the European Healthcare Quality Association (ESQH) for 4 years, is a Member of European Private Hospital Association (EPHA). L. Paškevičius delivered reports on the themes of healthcare, quality management and others in conferences and congresses: in Lithuania, USA, United Kingdom, France, Sweden, Norway, Finland, the Netherlands, Belgium, Germany, Hungary, Croatia, Macedonia, Greece, Estonia, Iran, Latvia and Russia. Marius studied Business Management and Business Administration, developed knowledge in information technologies, worked with banks, has accumulated considerable experience collaborating with companies and clients, business associations, the Chamber of Commerce, Confederation of Industrialists, the Chamber of Youth, Infobalt Association, ministries (Economy, Energetics, Interior), and etc. 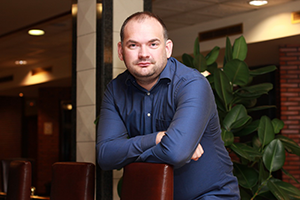 Marius is a Member of the Board of the Lithuanian Cluster Association, a President of Užupis Creative Cluster, International Security Cluster and Baltic Education Cluster as well as a founder and director of other clusters, a businessman. M. Pareščius became the first Lithuanian, certified as international clusters benchmarking expert according to methodology of the European Secretariat for Cluster Analysis – ESCA, located in Germany. M. Pareščius worked in Russia and Ukraine with producers of software, retail and wholesale companies, data centers, directors and shareholders of social networks, online gaming industry and information security companies. In Europe – with producers of software and hardware, international clusters and companies’ associations. Marius participated in creation of Internet projects for large companies, planned and installed teletext services for LTV, BTV and Lrytas TV. In 1999, together with a business partner, founded an online dating site Draugas.lt, which currently unites over 400 000 members from all over the world. As an IT expert, Marius participates in discussions, his statements are published in press and Internet publications: 15minučių, Delfi, Verslo žinios, Naujoji komunikacija, Kompiuterija, Lietuvos rytas, Respublika, Laisvalaikis, TV antena. He also writes articles and IT news for such publications as Verslo žinios, Naujoji komunikacija, Delfi.lt, participates as an interlocutor in TV and radio shows. M. Pareščius annually participates in the Commission of Lithuanian Product of the Year contest in INFOBALT Association and Confederation of Lithuanian Industrialists. As an expert, he participated in the elections of Product of the Year Worldwide of ITC sector. Marius also works with Infobalt Association with files, related to IT. Among activities – technological expertise in courts, mediation in solving disputes among partners, clients and contractors, continuous consulting for companies working with IT and telecommunication projects on creation and development of new projects. M. Pareščius actively propagates e-commerce, as a business in Lithuania, constantly works with Lithuanian banks and companies, which engage in or plans to engage in e-commerce business, consults on e-commerce, e-payment issues, contributes to annual organization, holding of e-commerce conferences, delivers presentations. He perpetually participates as a speaker at Infobalt (Vilnius), Cebit (Germany, Hannover), WHD (Germany), GameExpo (UAE), Sociality Rocks (Ukraine), GDC (Germany) exhibitions and conferences.